This year the kitchen is for the kids. Fun and playful is the theme. 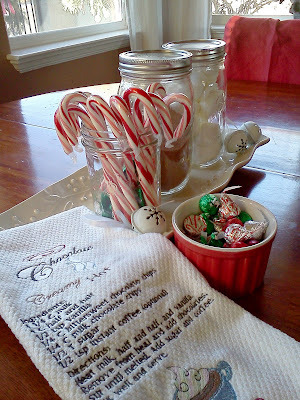 It all begins with a small hot chocolate station on the eating nook table. "I want a hot cup of cocoa with a marshmallow or two! I want a hot cup of liquid love, only the choc’late kind will do! I want a hot cup of cocoa to warm me up from head to toe!" I love the embroidered towel. A special gift from a special and talented lady! You will see a few of her projects in my kitchen. She is retired and spends her time sewing, knitting and crocheting. Many of her projects are featured in local stores including our Whole Foods as part of her home business, The Mother Cluckers. Too funny! Aren't the santa hats on the chairs adorable? The girls think these are the coolest things ever! Dollar Store strikes again. I still want to add more packages and filler to the baskets. Is it ever really done? 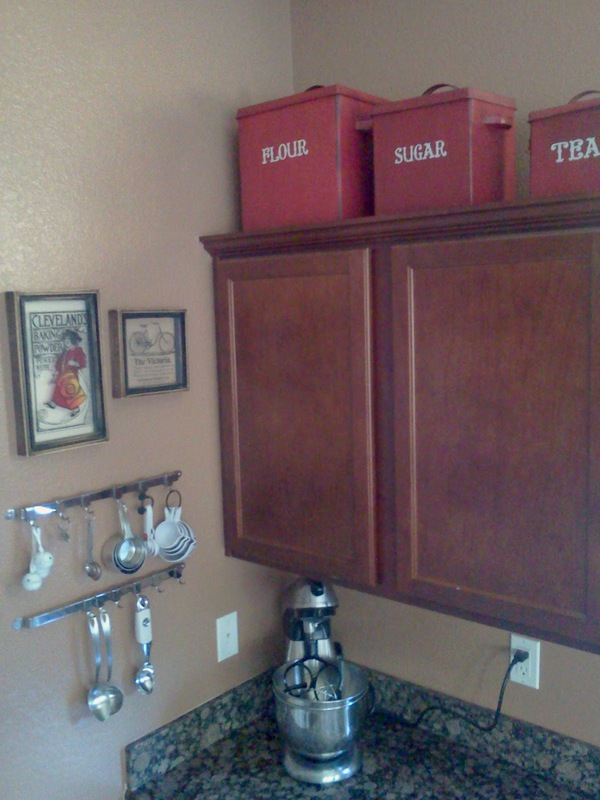 Speaking of not being done...I just realized I meant to tuck some greenery around the bins above Miss K's baking station. 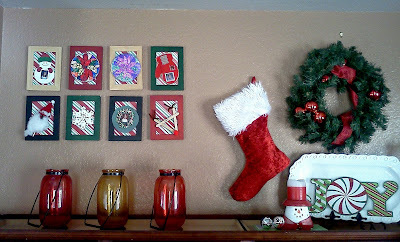 The only nod to Christmas in this corner is the jingle bells. 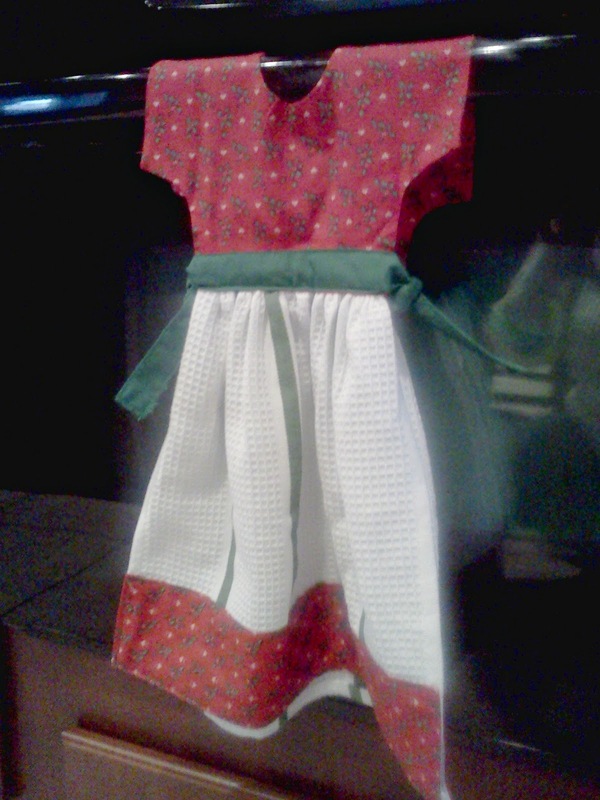 I have an apron on its way that will be hanging here along with some pot holders and the rest of the utensils that were patiently waiting in the dish washer when this photo was taken. Sigh, ah well, you know how it goes. And turning around we get a little joy and a snoman craft one of my girls, Miss K (I think) made me when they were little. I have more of their small projects in frames. 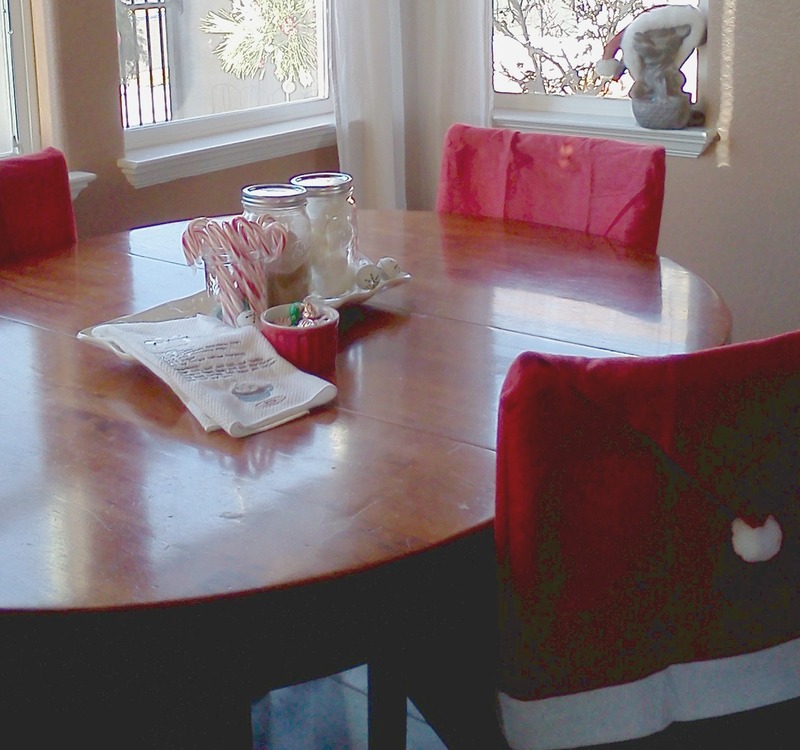 To the right is a manzanita branch hung with mini cookie and wooden toy ornaments. Unfortunately I struggle with getting decent photos in the kitchen, its just too bright and that corner was impossible! The oven is right below that manzanita display, but I had to show you another of Sandy's pieces of handy work. I bring this towel dress out every year and warn my family that if they use it, they may lose their lives. Its too precious to actually soil. 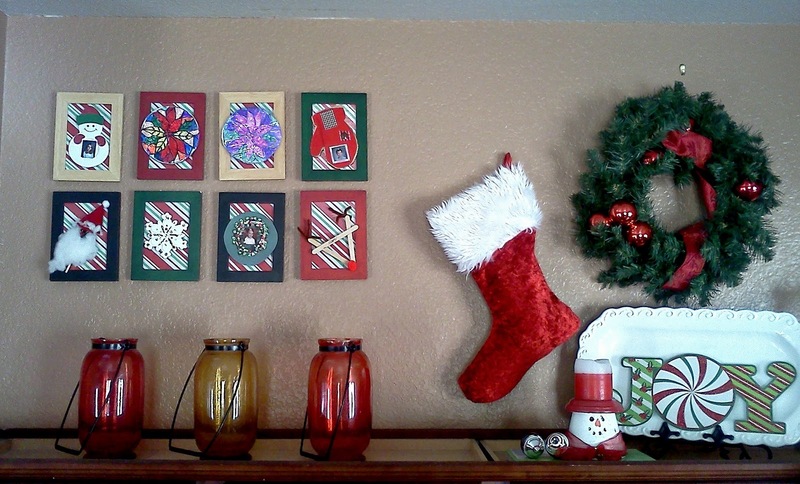 Do you have holiday items that are off limits? I don't have many, but there are a couple. 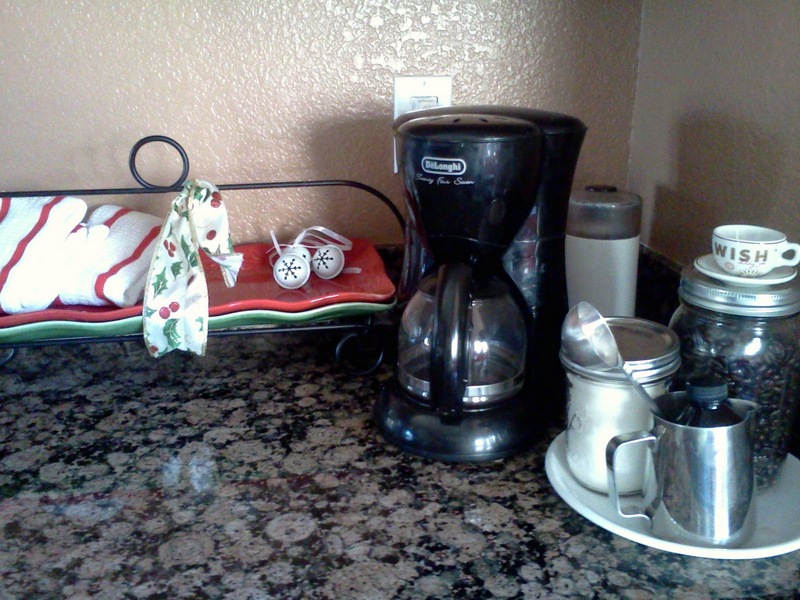 I just love your Christmas hot chocolate drinking station! My kids would love that I am off to set one up now, thanks for sharing such a cute idea! This is darling - never thought of doing this and now will rush to put something together! It's very cheery, even without the greenery.